Here’s Bounty Hunter’s full-race 6BR Improved IBS Light Gun, smithed by John Myer. It features a rare Stolle Polar action, a 28″ LV taper 1:8″ Spencer barrel in a Bruce Baer stock. 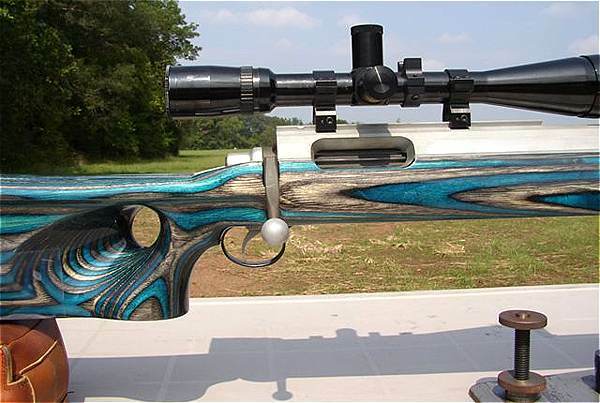 The gun shoots 100gr Clinch Rivers at 3130 fps with single digit ES and consistent 5-7″ groups at 1000 yards. The 6mm BRH started as a wish to build a 6BR Improved as a 600-yard gun under International Benchrest Shooters (IBS) rules and back up 1000-yard light gun. I knew that IBS was formalizing the 600-yard format. Seemed that a fast 6BR would be the ticket. I went internet surfing and soon discovered the Dasher, the UBL, the Bob Crone’s BRX and Bill Shehane’s BRS. As I shoot 1000 yard with Bill, I turned to him for information on the BRS. It looked like the BRS would easily give me 3000 fps with a 105 JLK (Jimmy Knox) and that looked like a winnable combination if the wind cooperated. PS: Do not call John about building you a gun. He will get a “big head” and start jacking up his prices and delivery times. He is a super top-notch 1000-yard BR smith and competitor that the Virginia boys love to have build their guns. I tweaked the BRS neck a little to make the BRH (sorry Bill) and Dave Kiff soon had me a .267 neck reamer. I sent reamer prints off to Neal Jones and one month later he returned a set of beautiful custom dies with shoulder bump. The obvious choice of stocks was one of Bruce Baer’s beautiful laminated stocks. A quick call to Gerry, his wife and real “stock master” in their shop and I soon had an inletted blue/black rollover thumbhole light gunstock on the way for $235. Bruce just happens to have a 16.5 lb light gun with a Polar action also in a 2-lb wood stock. My Heavy Gun barrel from Clay Spencer sure was doing its part, so naturally a call to Clay got a PA taper 28″ LV taper 8 twist. John got the barrel, reamer and stock while I searched for a scope. My prize turned out to be an EBay wonder of a Bausch and Lomb 24x for $175. 1/8 MOA clicks with small dot. John had a new set of Jewell 20 MOA tapered rings left over and we were in business when the 2 oz Jewell came in from Bruno’s ($145). About 3 months later the BRH was a reality. I fire-formed the brass with 30.0 Varget and 105 Amaxs. 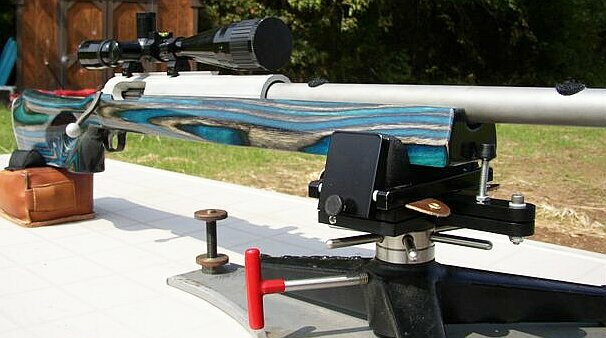 Set up a ladder test with 31.0–34.0 grains of Varget at 400 yards and 105 JLKs. Hmmm, sweet spot jumped out at 33.8 grain Varget, and 2985 fps. ES was little high with CCI BR primers. Switch to 450s and suddenly ES is single digits and “little bitty” bughole groups. Tried a couple groups in practice and seemed to group around 7-9″, but as the Baer stock had a half-flat on the bottom and my bag was only a single stitch, it did not ride well. Ordered a three stitch Bald Eagle over the 2003 winter and we are good to go now. Think Jack Snyder at Edgewood Bags is going to get an order for one of his mini-Gators when he starts taking orders in January as they are the Rolls Royce of bags. About the same time, I started emailing with one of the ballistics gurus on BR Central, Henry Childs (aka HBC). You know those guys that talk in “yaw, repose, spin drift, X and Y axis” or other “greek” terms to us mere mortals. He had been shooting some of the experimental Clinch Rivers 100 grain bullets (BC of .525) and doing very well. He convinced me to try them and so we are off again. Two nights on the range confirmed that 33.6 grains of Varget with 100 grain CRs, and CCI 450 primers was the ticket at 3130 fps and single digit ES again. 34.6 grains of Varget gave me 3190 fps and my first signs of pressure. Do not ask me to explain how dropping only 5 grains in bullet weight and .2 in powder gave me a jump of 145 fps, but I have confirmed it repeatedly with my chronograph. Competition Proven — The Gun Shoots! I have been shooting the BRH as my main light gun in 2004 while John builds another (300 WSM shooting 187 grain BIB Flat base bullets in a 12″ twist Broughton on Jerry Stiller’s Python action and another Baer blue/black stock). Pick it up next week!!! I have shot a 99 score and 6.060″ group in PA, numerous 5″ and 6″ groups this year in Virginia and Ohio 1000-Yard BR matches. Of the light guns that I have had, it has done as good if not better than most. Let a guy borrow it and he shot a 4.9″ at Ohio. Now anyone who has shot at Thunder Valley (Ohio) across those three deep ravines, through the gaps in the hills, knows that there is always wind and often from three directions at the same time. Right now the plan is to tweak the load and seating depth and see if she will tighten and shoot some 600-yard this winter. My load development really has been very minimal. With work and two girls in college in NC while I live in VA, my “range time” is non-existent. The “parentals” have to make runs to restock the poor children’s fridge/freezers and deliver care packages every 3-4 weeks. Think as soon as they graduate, I see another BR on the horizon. 1. Go with a .269-.271″ neck instead of .267. I don’t think much neck-turning is necessary for the 6BR. 2. Based on two more years of 6BR records and data now, I think the BRX or Dasher really offers more to the average shooter and reloader. 3. 28″ Broughton 8-twist barrel in their “5C” rifling. Faster, less fouling and as accurate if not more so than anything currently out there. 4. Run more brass through the Juenke machine (another story) to sort. Normally Lapua checks out uniformly but this 100 pieces was all over the map and some of the worst I have ever seen when I finally checked it 2 weeks ago on a friends machine. Mine will be in two weeks. Text Copyright © 2006 AccurateShooter.com | 6mmBr.com, All Rights Reserved. Images Copyright © 2004 Herman Hark/Jeff Walker, All Rights Reserved. Used by Permission. No Reproduction without advance approval in writing. Euro F-Classer: the "BAT Mobile"